Hi everyone. I'm pretty much a total beginner and I'm looking for some advice. 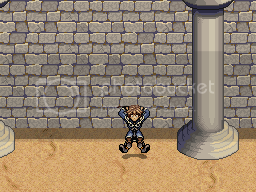 I just created the tiles for the upper section of the wall that you see above. What I'm not quite understanding is how to properly shade/texture the middle section of the bricks. I understand light sources, etc. but I don't really get how to shade this properly to give it texture and depth. I've been playing around with it for a while now. In an earlier draft (see below) the "blobs" of the light/dark shades in the middle of the bricks were larger, but I didn't like the way this looked so I kind of cut up the blobs into smaller pieces to see what that would look like. Could someone explain to me the proper way for shading something like this, and most importantly -why- you would shade it in that fashion? I'm really trying to understand why things are done a certain way, and not just how things are done correctly. Thanks. Oh also (mandatory plug) this art was created for a role-playing game that I've been working on for a number of years. Check it out if you're interested (its playable). We are looking for additional pixel artists!!! Pay attention how the individual mozaics have small variations on hue, saturation and/or lightness. You can do the same with your wall tiles, that will make them look a lot more real. GL! Hello, I've been struggling with that issue for a long time. Usually, i would start by rigidly drawing the lines between the bricks. From there I'd start shading the blocks one by one, running into exactly the same problems that you do. Some time ago I accidentally stumbled upon a method that has helped me a lot. I thrown together a quick mockup to illustrate. #1 Rather than starting with the lines, you start with a blank canvas and loosely paint the tiles on. Don't be to nazi at here, the purpose is not to make a mathematically perfect grid. #5 Offset it by 50% on both axis and pimp it again. Now, we have a base tile (you should clean it up more than I did). #6 The irony with tiling work is that the more detail you put into that single tile, the more it will look tiled. The 3x3 grid is made up by these two finished tiles. Really, I don't know if it's just me or what, but I find step #1 to be really important. When I start with lines, I tend to become a slave of them and that really hurts my pixeling. Your tiles aren't bad, but there is always room for improvement. The castles I've studied are typically not made of brick, and your walls looks like a lego palace. 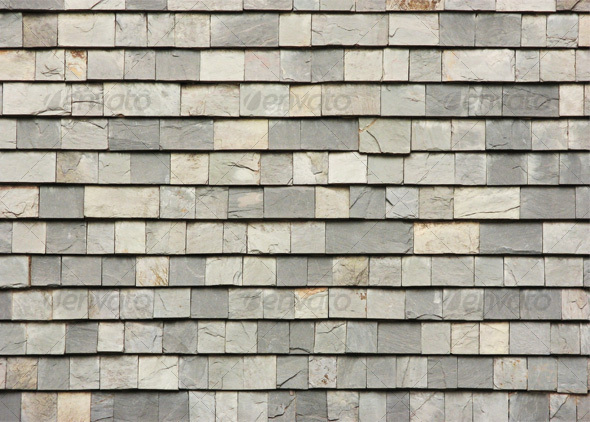 You need to have a look at different methods of masonry, like dry stone and fieldstone masonry. Those methods often employ a use of similarly-shaped stones, but with occasional imperfections of shape. Speaking of imperfections, a gritty texture will make them look a little more realistic - moss, lichen, chips and indentations in the stone, impurities (say the stone is limestone, but with deposits of red feldspar), and so forth. It's hard to get that kind of detail when you're limiting yourself to a few tiles, but you can get a really nice look and still eliminate the grid with just three or four tiles. Vedsten's edit does a good job adding detail, but it still suffers the grid. Fantastic tutorial! I agree with comments about taking it further with variations and details, and also starting out with different shapes instead of basic bricks but a great way to get stated. I would like to see the tutorial extended. Wow, thanks a lot for the pointers! Especially that tutorial, that really helps me understand how to do this much better. Also sorry I was late with my reply; I just got back from vacation. I actually saw a lot of brick buildings on my trip (in Minneapolis) and observed many of the things that you fellows pointed out here and it gave me some great ideas. I think I'll start from scratch again and see what I can do. I started from scratch tonight following that little tutorial and here's the result. I must say it looks much better. The only thing that bothers me is that now I've made what seems more like a stone wall than a brick wall. Which is fine, as I guess it makes more sense for a castle to be build from walls of this type. But if I wanted to make a brick wall, where the bricks were, in fact, all the same size, I'm not sure how it would come out looking. I could color the bricks differently to introduce variation, but it seems like I would be restricted from making bricks of different sizes (which is what my last wall tiles did). Any thoughts on that, or on this new wall I put together? Way too many colours on the pillars and design needs some. Bricks are better but I think the highlights r too harsh and too plain white, pixels need to get cleaned up and too many jaggies. U need to recede the colours a bit and since it is casting a shadow its conflicting light sources. I was looking at pictures of castles today and sometimes there are different height bricks on different rows too u can see if that looks any good. Agree with everything Decroded mentioned.